Some improvments to the plan have been made, however, it appears that many things remain unaddressed in the plan including bike safe arterials, a bike data program, bike safe bridges, and more. To comment in person, attend the meeting to speak and/or submit comments. To comment via email, send comments to [email protected] by 1-28-2015. UPDATE: Comments are being taken through 12-28-2014. 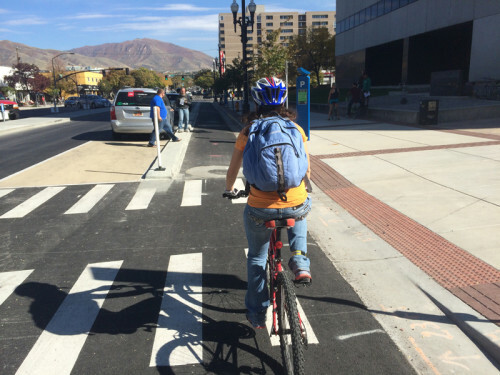 December 8, 2014 – Salt Lake City has released a draft of the long range Pedestrian and Bicycle Master Plan. The plan has been in the works for almost two years, and is now available in a pdf. Cyclists, pedestrians, and other interested parties are invited to comment on the plan. The plan will guide many planning and programming decisions over the next 20 years. Walking and bicycling in Salt Lake City will be safe, convenient, comfortable, and viable transportation options that connect people to places, foster recreational and economic development opportunities, improve personal health and the environment, and elevate quality of life. Developing a low stress bicycle network to appeal to those riders who are interested, but concerned about safety. This will include a protected bikeway network, and a network of bicycle boulevards. Editor's Note: Cycling Utah's previously submitted proposals are here. We will post comments on the draft plan soon as well.